Recently, my editor and I have been making it a quasi-habit of attending exhibit openings at the Richard Heller Gallery at Bergamot Station. (My previous review of a show at this gallery can be found here.) The most recent opening was a series of photographs by Corey Arnold, who was in attendance at the opening, which contained many moody and atmospheric images of the ocean, of various sea and land creatures, and of the outdoors. My editor remarked to me that even my usually museum-avoiding mascot would enjoy this exhibit. The majority of the exhibition was made up of truly excellent photographs of ocean scenes that brought both my editor and me into the world of the photographs. We felt the cool spray of sea foam and the slightly chilly nippy air; we smelled the salt of the sea and heard the keening of seagulls and the flapping of their wings. My editor stopped for a long time before “Slack Water”, a photo depicting a molten, choppy ocean underneath a sunset, which created an interesting visual and textural contrast. Throughout the exhibit Arnold displays a remarkable sense of texture-his photographs are very tangible and all of the pieces on display displayed minute and exact detail, whether the subject be a coil of rough rope or the feathers of a bald eagle, or various types of caught fish as in “Beamer Catch”. A true highlight of the exhibit is “Salt Birds”, a cinematic capture of gulls startled, flying away from the camera, surrounded by sea spray. Arnold’s love of the sea permeates his work, as displayed by the piece “Salmon Shark” which displays a rainbow range of colors in the visible fin of the fish and in the water, hidden by the flatter gray of the ocean. 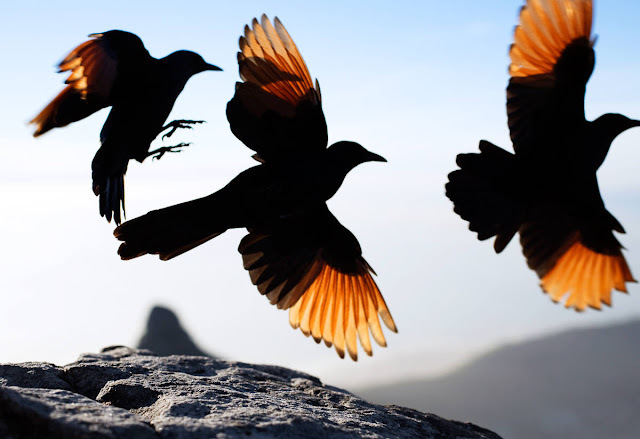 Another highlight is “On Table Mountain”, which depicts three birds in various stages of flight, lit from behind in a black and fiery orange glow. I highly recommend this exhibit for lovers of art and for lovers of the sea. Your words create images which bring the photos to life for anyone who hasn't seen them. I hope your readers in the LA area get to see this show. Even museum-avoiding mascots should give it a try! The photos with the ocean themes were fantastic and yes, Slack Water was certainly my favorite. Great Job!